I wrote some weeks ago about Stephen Colbert’s SuperPAC, a real-life political fund and comedic awareness campaign that highlights the absurd logic of our corrupt campaign funding process. On Thursday night, the campaign took a new step, explaining in an incredibly clear manner this Kafkaesque political labyrinth. I love to laugh. And I don’t do it discreetly. It’s one of the things friends remember about me. Sometimes it scares babies. It was part of what first drew me to my partner — our ability to laugh together for hours. It should be no surprise, I suppose, that she became a stand-up comic soon after our marriage. I like humor with my politics as well, which is why I’ve been so thrilled with the recent antics of Steven Colbert. 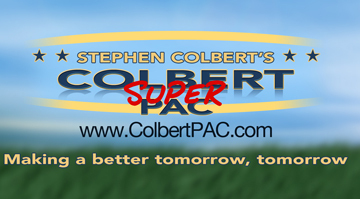 For those who haven’t been watching: after the the Supreme Court ruled in Citizens United that corporations cannot be kept from spending unlimited money to influence political campaigns (because money is speech and corporations are people, and other craziness), Colbert used his show to launch his own Super Political Action Committee, Colbert SuperPAC. By publicly creating and running this organization that can raise unlimited funds, and use them in any way Colbert decides with no disclosure, Colbert sheds light on the absurdity and corruption of the whole election financing system. These rules, which free up corporations from even a semblance of regulation and allow them absurd amounts of control over elections, would never be part of a well-functioning democracy. People should be, and are, angry. But the details are very dry and technical—not the easiest issue to rally around. Besides, it’s based on a Supreme Court ruling, so while there may be some policies that could be put in place to curb it, what is really needed is a cultural shift away from this interpretation of the constitution. Many comics satirize the news, but this is something new. Colbert is, in some ways, entering the world of electoral organizing. He is moving people to do something other than just continue to watch his show. He has thousands behind him willing to give money to the running joke. He has garnered critics on the right and the left, some who worry he’s opening new loopholes for people like Sarah Palin at Fox News. But at a time when even electing a democratic president means more tax breaks and more wars, perhaps what we need most is someone to simply uncover the corruption rampant in the system. Humor has a long relationship to social protest. The traditions of the jester, who satirized the powerful, and the carnival, where social hierarchies were turned on their heads, continue to wind their ways through our culture. Colbert himself is basically a jester character, one who is allowed by his rulers (in the past the King, now Viacom) to lampoon those at the top of the ladder. And humor has been used as a tool by organizers and activists. Saul Alinsky, whose quote about the power of satire is at the top of this post, discussed having a “fart-in,” powered by baked beans, though I don’t know if he ever did it. The organization ACT UP has for years wielded camp and humor to raise awareness of AIDS and confront homophobia. And these days you might run across Billionaires for Bush at a rally. Still, from my own experience community and youth organizing, and even cultural organizing, is a lot of things — moving, inspiring, angering, loving, all very important — but it is rarely funny. Behind the scenes there may be quite a bit of laughter as people bond, build relationships, and just get through the day. But this is not an explicit strategy, and it’s not the face that is shown to outsiders or newcomers. Even much of the activist satire, like the Billionaires above, while enjoyable and though-provoking, doesn’t really make me laugh out loud. You can see in the video that most of the audience is smiling, but not so much laughing. And laughter is so important — to healing, to relationships, to feelings of solidarity and power, to infusing joy into a movement. One of the strengths of cultural organizing is that it pays as much attention to the quality of the art as to the political goal, because in that quality is the power of expression. I see a lot of potential in taking this attitude towards the use of satire in organizing. What would it look like if we drew on practicing comedians — stand-up, sketch — who had delved deep into the art of making people laugh? And while much of the satire that I have seen in organizing has been one-off performances for events, what if we thought of full satirical campaigns, a little like what Colbert is doing? It would look quite different coming from the grassroots, but organizers are experts in campaigning. Just some thoughts to start off the blog. Have you seen something really funny used in organizing? I’d love to hear about it.